Tomorrow LG is going to finally make the G2 official. 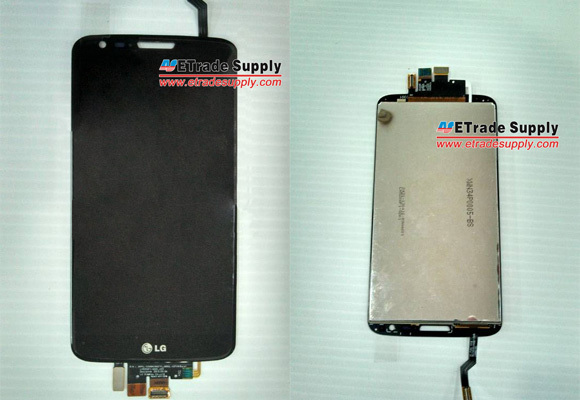 Before that though, we get to peek at the phone once again as ETradeSupply has leaked some of the phone's parts. More specifically, the display and front glass panel of the G2 are displayed below. The LG G2 is said to sport a 5.2" 1080p display. It is expected to be powered by the Snapdragon 800 chipset with a 2.3 GHz quad-core Krait 400 processor and 2GB of RAM. At the back, the smartphone should feature a 13MP optically stabilized camera with LED flash and the volume rocker around it. By the sound of it, LG definitely has a shot of selling upwards of 10 million units of the device. The series of leaks and photos also show that it's quite the looker. Furthermore, a report from Korea's MK News suggests that LG's latest flagship is going to hit home turf the very next day, on August 8. In the US, AT&T, Verizon, T-Mobile and Sprint are said to offer the device as early as September. Japan's NTT DoCoMo will be getting a hold of the smartphone, too. As we reported earlier, about 100 carriers worldwide will have the LG G2 on offer just 3 months after its release. We'll know all the details of the LG G2 at tomorrow's announcement event in New York starting at 11AM EST. The event is going to be streamed live as well.